Patricia Banks RN, BScN, AFC is a Canadian Landscape painter best known for her detailed oil and acrylic paintings. She travels widely and is inspired by the magnificence and splendour of the natural environment. Her work is sensitive and evokes the moods and emotional effects of atmosphere revealing an intuitive grasp of the subtleties of time and place. Patricia’s paintings begin outdoors with direct experience and observation in nature. She can often be found painting on location outdoors, or in her studio using the reference material she has gathered to create a larger painting. Patricia has exhibited across Canada and in the USA, and she has won several awards for her work. 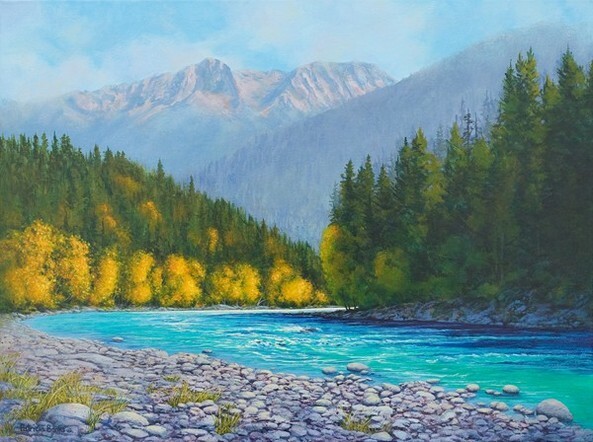 She has been an invited workshop presenter for the BC Art Teachers’ Association and enjoys teaching drawing and painting classes and workshops. Patricia has written numerous art related articles, and she currently writes a monthly column called Art Adventures for Nanaimo Magazine and Voyageur Magazine. Patricia is a graduate of the University of Victoria, Victoria, BC. She is a juried member of the Artists for Conservation, the International Guild of Realism, and Oil Painters of America, organizations that regularly show their members’ work in prestigious International Gallery shows and Art Museum exhibitions.